Today, Gary had two softball games. He pulled his hamstring quite badly last weekend so he wrapped it up this weekend and played it safe. He's got bruising from the back of the calf up to the thigh...looks tough I guess. Then, I had a football game in Vancouver. It was our second game of the season and we won! Yay...glad to finally get a lot of completions, touch down passes and even a touchdown. Our defense was awesome and it was a lot of fun. Thanks to lil sis for watching cutie Kai. Gary just installed a light/fan thingy in our bedroom so I'm excited not to sweat my brains out this summer. Just wanted to let you know one of my favourite inventions ever: `Tide To Go' pen, so amazing. Wow. I kind of just want to stain my shirt just to use it again. Fortunately with Gary around, it gets a lot of use! Half way done my course.....learning lots. Kai learned to clap today, what a smartie. Happy birthday to my dad who turns 53 tomorrow. 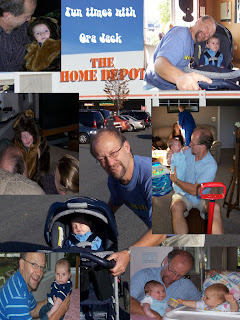 Here's a collage of pictures of Kai and my dad when Kai was just a little baby. My dad made sure that Kai made it on important outings like Home Depot and The Wired Monk.